As happens at Christmas every year throughout the Muslim world, Christians and their churches were especially targeted–from jihadi terror strikes killing worshippers, to measures by Muslim authorities restricting Christmas celebrations. In Denmark, Christmas Eve witnessed Islamic demonstrations and cries of “Allahu Akbar” (“Allah is greater,” meaning: than anything.). In Indonesia, Muslims in the Aceh province protested against Christmas and New Year celebrations and called on authorities to ban them. Days earlier, an influential Islamic clerical organization, the Ulema Consultative Assembly, issued a fatwa, or opinion, “prohibiting Muslims from offering Christmas wishes or celebrating on New Year’s Eve,” the AP reported. In Somalia, the “moderate” government–as it is often portrayed in comparison to the Al Shabaab (“The Youth”) opposition–banned Christmas celebrations. Hours before Christmas day, the Ministry of Justice and Religious Affairs released a directive banning any Christian festivities. In the words of one ministry official: “We alert fellow Muslims in Somalia that some festivities to mark Christian Days will take place around the world in this week. It is prohibited to celebrate those days in this country.” All security and law enforcement agencies were instructed to quash any Christian celebrations. In Pakistan, during Christmas Eve services, “Heavy contingents of police were deployed around the churches to thwart any untoward incident.” In some regions, “prayer service at major churches focused on remembering the Pakistani Christians who lost their lives in terror attacks.” Three months earlier, for instance, Islamic suicide bombers entered the All Saints Church compound in Peshawar after Sunday mass and blew themselves amidst approximately 550 congregants. They killed 130 worshippers, including many Sunday-school children, women, and choir members, and injuring nearly 200 others. Russia: In December, it was revealed that a total of seven Christian churches were torched in 2013. In Tatarstan, a Muslim-majority republic in Russia, according to Asia News: “Churches burned, attacks foiled and increased pressure on Christians to convert to Islam. In Tatarstan–autonomous republic of the Russian Federation, with a Muslim majority–the extremism alarm is increasing.” Although the culprits setting fire to churches are “unidentified extremists,” Father Dmitri Sizov, pastor of Pestrechinsky, said that “the whole community knows that it is the work of the Wahhabis [Islamic literalists]” who “roam, inviting the faithful to convert to Islam.” But “the priests remain silent because they are afraid of being accused of incitement to religious hatred,” added Fr. Dmitri. Egypt: “The nation’s most well-known convert from Islam” to Christianity — Bishoy Armia Boulous, 31–popularly known by his former Muslim name, Muhammad Hegazy– was arrested in a cafÃ© for allegedly inciting “sectarian strife,” among other charges, according to Morning News; he “is likely being tortured.” Authorities claim he was working with a Coptic satellite station to create a “false image” of violence against Christians in Minya, Upper Egypt, where attacks on Copts are common. Human rights activists close to Bishoy, however, say “his arrest had nothing to do with any reporting work but constituted retaliation for becoming a Christian” and possibly for evangelizing to Muslims. 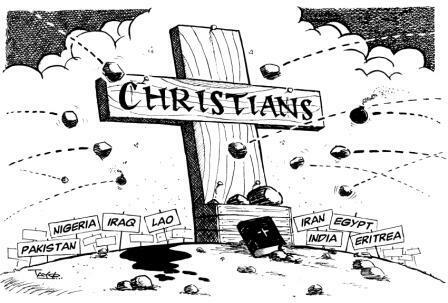 While not all, or even most, Muslims are involved, persecution of Christians is expanding. “Muslim Persecution of Christians” was developed to collate some–by no means all–of the instances of persecution that surface each month.